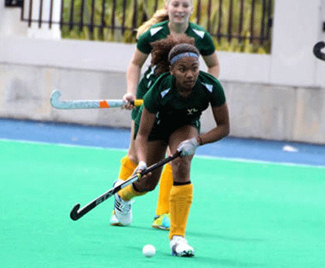 Maha Clarke’s teammate Mazvita Mtisi scored the golden goal in the Queens University of Charlotte Field Hockey 5 - 4 over-time victory over Bellarmine University at Bessant Field. The win improves Queens University of Charlotte win streak to a program-best five games as Queens moves to 5-1 on the year. Mtisi scored the game-winner drilling the ball into the cage with 7:30 left on the clock in overtime. The goal was her third of the day giving her the game-high in the category. Jill Sherman and Karla von Ehren each added one goal and one assist, while Mette Beekman also tallied an assist. Two-time AstroTurf South Atlantic Conference Carolinas Defensive Player of the Week Jet van den Berg took the win in goal after totaling five saves. Von Ehren was the first to score this afternoon, giving the Royals a 1-0 lead in just the 8th minute of action. Mandi Isom of the Knights responded in the 20th to knot things up, 1-1, but Mtisi scored her first of the game soon after to return the advantage to Queens, 2-1. Bellarmine then answered with back-to-back goals to move in front, 3-2, with about five minutes left to play in the half. The first would come from the stick of Cassidy Sweeny in the 27th and a foul in the box would lead to the second which was scored on a penalty shot from Jillian Fazio. It seemed the Knights would carry the 1-0 lead into the break, but the Royals had other plans capitalizing on a fast break opportunity to equalize the match at 3-3. In the 32nd minute, Sherman found a racing Mtisi in front of the cage who was able to put the ball in the net for her second goal of the day. The score remained tied at 3-3 until Sherman scored a go-ahead goal in the 68th minute of action, but a goal from Bellarmine's Isom with just 11 seconds left to play would send the game into overtime where Mtisi scored the game-winner. Queens outshot the Knights, 18-14, putting 13 shots on goal to Bellarmine's 11 shots on goal. The Royals also earned nine penalty corners to Bellarmine's six. Isom led the Knights with two goals while Breanna McWhorter totaled six saves after playing 37:30 in the cage.